Figulus Oy is a Finnish family company from Helsinki. 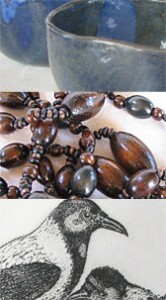 We make Finnish ceramics, art graphics, jewellry and other decorative articles. The idea behind our products is their longevity and practicality. Nature and durability are the key elements in our design. We want our products to bring joy and satisfaction into everyday life. Figulus beads- web shop: http://shop.figulus.fi We are located in the glass pavillion on Hakaniemi market square! Opening hours: Monday to Saturday: 8:00am – 6:00pm Welcome shopping!